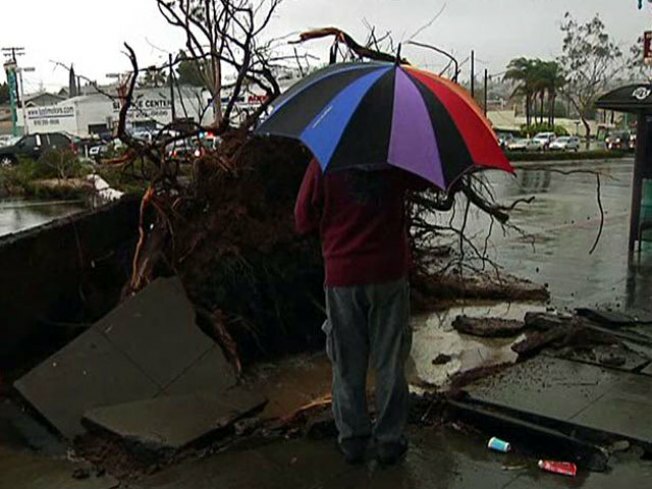 The second major storm to swamp San Diego in two days brought tornado warnings, severe thunderstorm warnings, heavy rains, strong winds and caused damage from flooding to downed trees. Among the most serious incidents, a tree crushed a trailer along Old Highway 80 at the Country Creek RV Park, killing a woman in her 50s. Firefighters used chainsaws to cut through the tree, described sd between four and five feet thick, hoping to reach the woman believed to be trapped inside. The woman's neighbor, Carl Golden, was inside his RV when he could hear the wind blowing. He was in the back of his RV when he felt the trailer move and watched the roof cave in. Golden was able to make it out of the RV. The woman was found dead inside the RV after about an hour, according to San Diego County sheriff's deputies. The National Weather service issued two tornado warnings. The first involved areas of the North County from Oceanside to Encinitas. Ten minutes after the first warning expired, a second warning was issued for central and south county including La Mesa, El Cajon, San Diego, Coronado and Chula Vista. That second warning expired at 3:15 p.m. The powerful storm system, the second in a series expected this week, moved across the county and caused nightmares for homeowners, emergency crews and even drivers. Rain started falling in downtown San Diego before noon. Winds felled trees in a parking lot in Scripps Ranch, on a home in North Park, along Mission Bay Drive near Quivira Basin and along El Cajon Boulevard in University Heights. A jack-knifed big rig shut down all northbound lanes of I-15 at Scripps Poway Parkway just before 3 p.m. As of 5 p.m., traffic was flowing again smoothly. A school bus window was damaged when a power pole fell, hitting the bus at Steele Canyon Road and Heatherwood Drive around 3:20 p.m. The children, from Dehesa Elementary, were not injured and were transferred to another bus after the accident. Steele Canyon Road was closed until the power pole could be fixed. 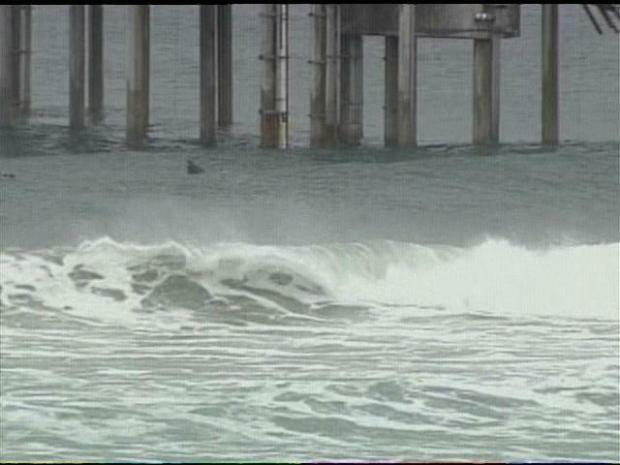 As of 4 p.m., San Diego Gas & Electric reported 79 outages putting close to 70,000 customers without power.